Today, I am sharing with you a card that I made featuring the “Flakes” stencil from The Crafter’s Workshop. 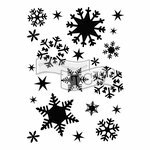 If you love snowflakes, like I do, then you will love this stencil! It reminds me of the first snow of the year; it’s such a beautiful site to see all of those big fluffy flakes coming down. The only problem is….I am pretty much done with winter and the cold after that first snowfall! I am really a summer girl at heart. 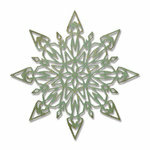 Still, I do appreciate the beauty of the snowflake and enjoy featuring them in my winter craft project. Hope you enjoy this project too!